GUANGZHOU - The success of the Guangzhou 2010 Asian Para Games reflected China's efforts to improve disabled people's affairs, said Wang Xinxian, president of the National Paralympic Committee of China. The Guangzhou games was the largest Asian sports event for disabled people held since the Asian Paralympic Committee came into being in 2006. The games, which concluded on Sunday with an amazing closing ceremony in Guangzhou, the capital of Guangdong province, attracted 2,512 athletes from 41 member countries and regions of the Asian Paralympic family. The athletes took part in 19 sports. "In just two years, China has held two international sports events for disabled people - the Beijing Paralympic Games in 2008 and the Guangzhou Asian Para Games - reflecting China's efforts to improve the lives of disabled people," Wang said. To ensure the success of the games, the host city of Guangzhou made great efforts to improve non-barrier facilities throughout the city. "But most importantly it is the non-barrier attitude of people that has led to the success of the games. I have been greatly touched by many people - performers at the opening and closing ceremonies, volunteers, security officials and local residents - for their contribution to the games," Wang said. The games also helped to arouse people's awareness of the need to provide more care to disabled people and to protect their rights, he said. "The aim of the games was not to let people know how many records were set but to promote awareness of how disabled people take part in social and sports affairs," Wang said. "Moreover, we want people to focus on disabled people's determination and their growing strength. This strong spirit, in return, will help to inspire many people to do better in their lives," he said. 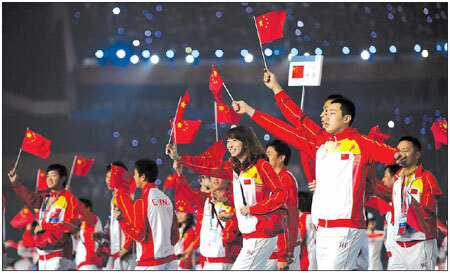 According to Wang, China plans to introduce more sports for disabled people in the next five years. "We are considering including more sports with international standing to ensure more disabled people have access to sports," Wang said. 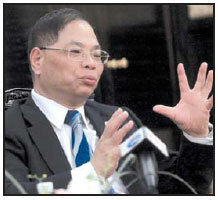 For example, wheelchair tai chi should prove to be very popular with disabled people, according to Wang. "I have seen many senior people, including disabled persons, in a residential community practice tai chi. They told me that the sport had greatly helped them to improve their physical movement." The introduction of new sports should not only cater to spectators' interests but also help disabled people cope better with their physical problems, Wang said. He added China would improve its efforts to better protect disabled people's rights given many disabled people are still struggling to make a living in under-developed and rural areas. "There are some 10 million disabled people among 40 million poverty-stricken people in China. Moreover, up to 30 percent of disabled children do not have access to schools," Wang said.